I used approximately 35gm each dark and light blue 8ply 100% Wool of unknown brand. Cast on 57 sts in light blue and work the chart below garter st using the mosaic technique. Ie: Each row of the chart represents two rows of knitting. 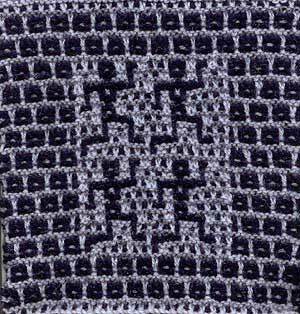 The first row is knit using dark blue since the first square of the chart for that row is dark blue. Knit all sts represented by dark blue squares and slip all stitches represented by white squares. Turn and knit the stitches you knit on the previous row and slip the stitches you slipped on the previous row. Keep the yarn at the back of your work at all times. Always knit the colour represented by the first stitch of the chart and slip the other colour.